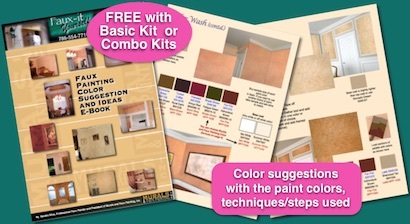 Do you need help in choosing colors for your faux painting projects? 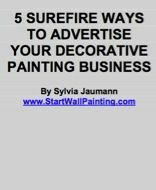 A great place to get ideas for the colors to use in faux finishing is to look at walls that someone else has faux painted. However, even after many years of faux painting, it is difficult to figure out what colors were used because of the fact that the colors are blended out and are much lighter after being mixed with glazes. In addition, if more than one color is used, then it's even more a task to figure out what colors were used. Well, we have great news. Here's a great tool not only to help your creative juices flowing, but you can eliminate the guesswork of what colors to use. 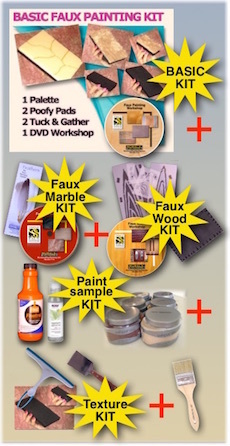 Now for a limited time, you can get a FREE Faux Painting Color Suggestions and Idea E-Book when you order our Basic faux painting kit, or any of our Faux Painitng Combo kits. You will be emailed a link to be able to download your E-Book to your computer. You can print the E-Book for your personal use, too (all copyrights reserved. So far there are over 23 faux painting suggestions for you to choose from with the colors used for each one. For example, you will find suggestions on what colors to use for the Old World Parchment faux finish. There are a variety of colors we suggest for Faux Color Wash, Faux Brick and many others, also. 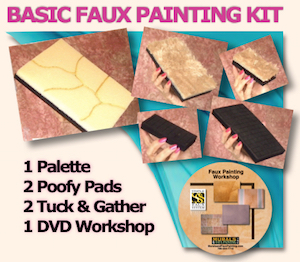 Since you will be using the tools included in the Basic Faux Painting DVD kit, some faux finishes show you suggestions on how to load your Multi-Color Faux Palette. The book is at least a $40 value. We will throw in a FREE Faux Painting Business E-Booklet, too. With these E-Books, Faux Finishing just got easier! **For a limited time only.